UpStage is a web-based venue for live online performance. UpStage is a purpose-built web-based application for live online artistic performance (cyberformance). Distributed players manipulate pre-loaded media (images, text, audio, live web streams, etc) in real time to present performances to an online audience who can interact with the work via a text chat. UpStage is a server-side application; players and audience need only a web browser (with the Flash player plug-in) and an Internet connection. This makes it very easy for audiences – there is no need to download, install or learn new software as everything is delivered to the web browser. The server application is freely available for anyone who wishes to create their own UpStage, and the project operates a server which is used by a number of artists who do not have their own server. 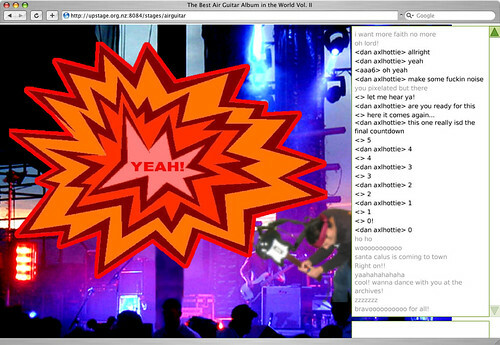 The vision for UpStage was developed by the globally distributed cyberformance troupe Avatar Body Collision, whose members began creating live performance using free chat software in 2000. Funding for the first version of UpStage came from the Smash Palace Collaboration Fund in 2003 (a joint venture between Creative New Zealand and the NZ Ministry for Research, Science and Technology). A second grant from the NZ Government's Digital Strategy Fund in 2006 enabled the development of UpStage V2 which was launched in June 2007. Partners in the development of UpStage include MediaLab, CityLInk and the Auckland University of Technology, and we have been fortunate to have the ongoing services of lead developer Douglas Bagnall, who is also a digital artist. UpStage is live performance software made by artists, for artists. Currently UpStage is unfunded, and ongoing development is being undertaken on a voluntary basis Bagnall and a team of software development students from AUT. During 2008, the UpStage development team will be implementing new features and in August will hold the 080808 UpStage Festival – the second festival of performances in UpStage (the first being 070707, in conjunction with the launch of UpStage V2). The UpStage server application is licensed under Creative Commons Attribution-NonCommercial-ShareAlike 2.5 licence and GNU General Public Licence (GPL). Those creating work in UpStage are also encouraged to adopt Creative Commons licences for their content. All media uploaded to the open UpStage server (which is used by numerous artists) are available to anyone with a log-in to that server; therefore, the UpStage development team asks participants to be open to sharing media at the same time as respecting others' work. To date, no problems have been experienced with the use of UpStage with respect to these licences. One of the motivations for creating UpStage was the impending obsolescence of The Palace graphical chat application. The Palace was developed by Communities.com from 1995 to 2000, at which point the company ceased its development. As it was not open source, the future looked grim as The Palace became increasing incompatible with newer versions of operating systems. In creating UpStage, the development team was determined to make software that could be developed by a community, that would grow in the directions the user community wanted and needed, and that would not become obsolete as long as there was someone who wanted to continue its development. They also knew that our funding and resources were limited; therefore open source seemed the most likely route for sustainability of the project. While UpStage itself is open source and most of the other software tools it requires are also open source, it is not quite an end-to-end open source solution: users must have the Flash player plug-in for their browser, which is a proprietary application. The UpStage development team has investigated the feasibility of using Gnash as an open source alternative to Flash, but it was thought that at this stage it would compromise UpStage's functionality to such an extent that it is not viable. It is hoped that in the future, UpStage will be able to be open source end-to-end. This page was last edited on 18 September 2009, at 19:55.